This is one of our favourite retro artifacts found on tour. We happened upon this in 2012 at The Songdowon Hotel in Wonsan. 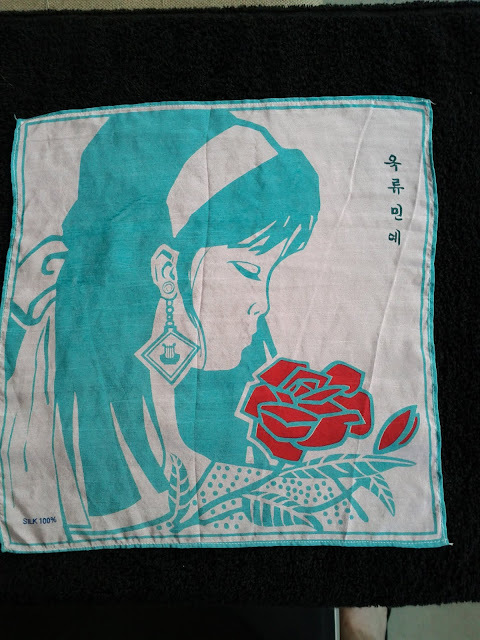 The piece is a 100% Silk Scarf, hand-produced in a folk-art style. The Korean characters read Ok-Ryu Folk Art (옥류민예). Based upon the symbol in the earring, it was likely produced as a souvenir for guests of the April Spring Friendship Art Festival.